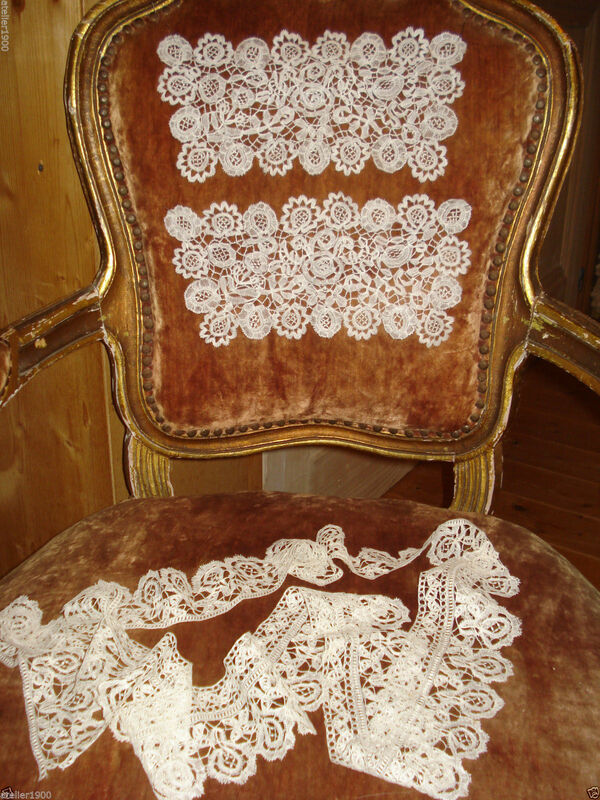 Comments: A Belgian lacemaking pillow (kussen) with appropriate stand. The top narrow part of the pillow can be detached and moved to the bottom in order to give the bobbins a little extra room at the bottom of the lace (the pins still have to be taken out and the lace moved to the top to continue). It should have a wedge-shaped base with another drawer, however the photos do not show the bottom of the pillow. Note the leather apron at the bottom which provides a better surface for the bobbins. The bobbins shown on the pillow are modern Danish, but there appear to be a few Flemish bobbins in a box that go with the set. There is a pincushion shown in one photo. Typically these pillows are stuffed with wool (occasionally horsehair), and their making was quite a large cottage industry. I’m about to change the lace at the top of the LaceNews blog to something that will speak directly to this industry. I have 6 of these pillows in my own collection, and the surfaces are wonderfully smooth and firm. The base pillow will be covered in a sturdy canvas, the blue cloth seen on this one is added by the lacemaker and can be changed out. The stand is a sturdy base, height adjustable, and is a more recent product than the pillow. Provenance: Cushion passed down to seller’s wife who was born and raised in Bruges. Date: Cushion about 100 years old, stand about 40 years old. These pillows were used in Belgium and some parts of Northern France. Damage: Crack in the wood at the front part of the large pillow section. What looks like a smaller crack near one of the holes in the top part of the large section. Sold for $221.50, 8 bidders. Size: 4″ max width, 2.5″ min width, 24″ long (I think measured along the outside edge, but not sure). 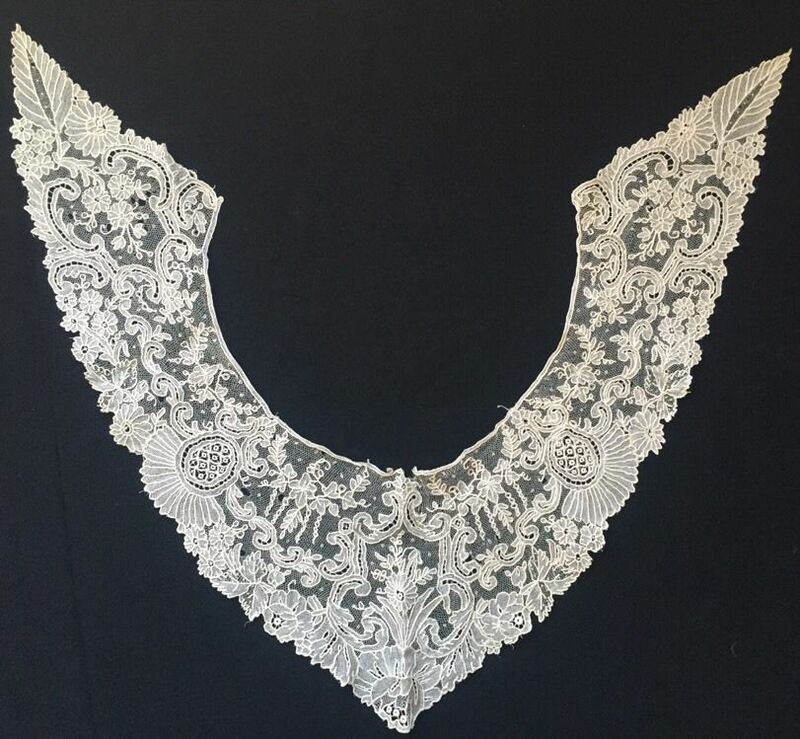 Comments: A collar with pointed ends, Point de Gaze with no raised work. Well organized design, with a few grid decorative ‘mode’ fillings. Damage: Small holes and pinholes in te mesh throughout. Soilage: LA few localized brown spots. Finish: Center back vertical fold crease. Sold for $28.55, 4 bidders. 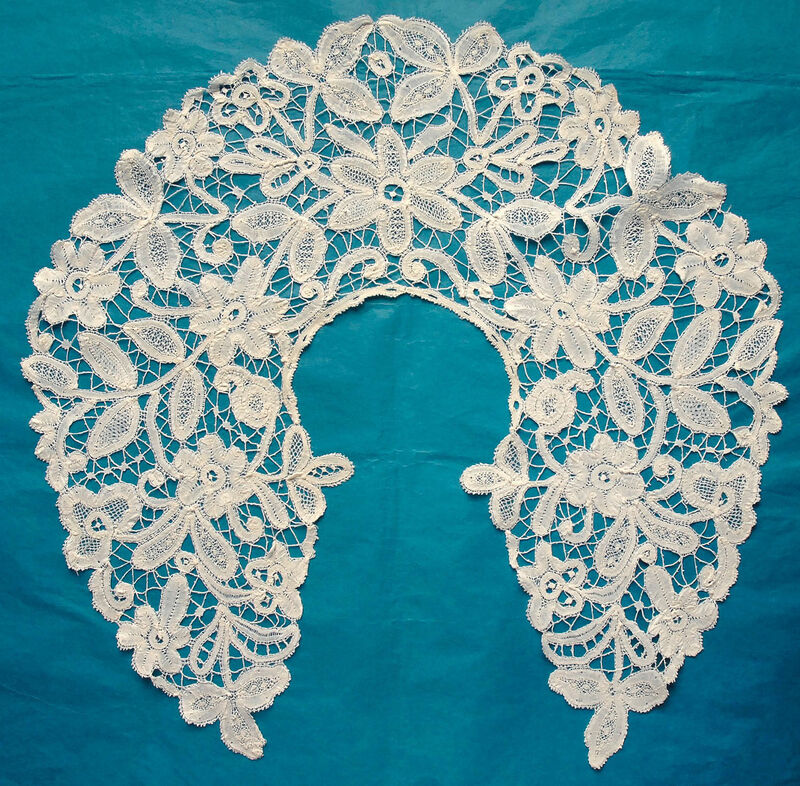 Comments: A fairly deep collar of what might be a Bruges pieced lace. Note the ‘islands’ in the picoted brides. But the fillings in the leaves and flowers are unusual for Bruges, so I’m wondering if this might come from some other region. There are some Eastern European pieced laces that often get ignored. But for the moment I’ll stick with Bruges. Damage: A few frayed threads at terminations. Sold for £18.00, 2 bidders. Comments: A narrow border of square mesh Valenciennes, of the type sometimes called Valenciennes Anglaise. Very sparse pattern, typical of late 18th early 19th c. In this one the design is even sparser than usual. The technique is precise using very fine thread. Modifications: Ends cut and secured, one join, engrelure added. Sold for $22.50, 2 bidders. Comments: A very long 18th c Alençon border. Réseau fin with a closely worked toilé. Fillings include picoted rings and bars, some stars, and a little brides bouclé. No picots on the cordonnet except at the lower edge, and no horsehair left in this piece. The design is more Louis XV without the undulating trails, a little later than mid 18th c.
Damage: Some well-done repairs to the réseau. To find a mesh this good in a piece this old is exceptional. Sold for $149.00, 1 bidder. Comments: A long Point de Gaze flounce with one raised petal rose in each repeat. Note the diamond ‘windows’ in the raised petals, sign of a better manufacturer. Includes an elaborate decorative ‘mode’ fillings in oval cartouches. Flowers have more typical Point de Gaze concentric wheel fillings with a chain of rings around the edge. Romantic, naturalistic floral design, no esprits in the ground. A higher end market piece. Finish: Engrelure a little creased in places. Size: 44.5″, 3.5″ wide center, 2.5″ ends. Comments: A joined pair of late 18th c Alençon lappets. Réseau fin, with a light later 18th c design, fillings confined to small areas along the edges and a little more at the ends. Small sprigs used as esprits mid ground. No picots on the inside cordonnets, only along the outside, and no horsehair left in place (much like the border reviewed above). A good example of the type. Modifications: There’s no clear view of the center, so hard to tell if anything was cut before joining. Damage: Repairs to the réseau, also some strengthening at one end. Occasional broken thread in the fillings. Comments: A pair of lappets with square end. 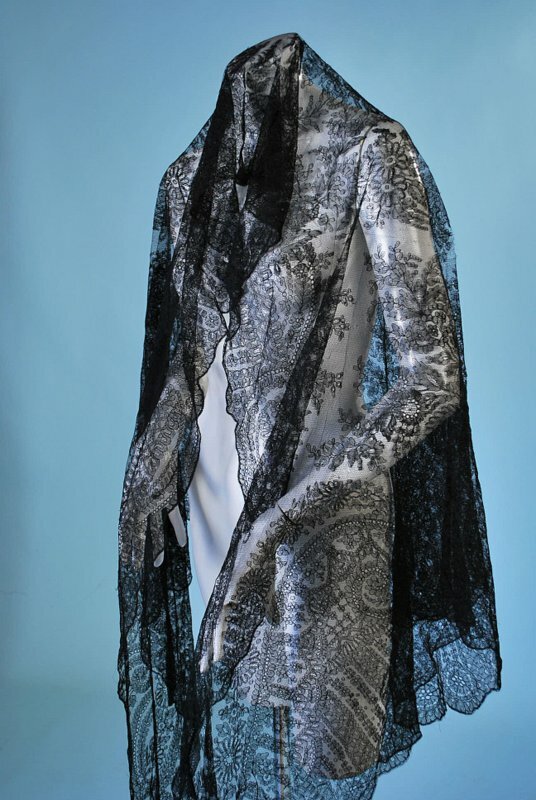 The term Point d’Angleterre is historically used to describe lace like this (having to do with competition from the English market), but these days we like to be more precise. It looks like a Brussels pieced lace, but the ground is a 6-pointed star which is unusual. This type of ground is often found in contemporary Brabant laces, but the work here seems too fine for that attribution. Another unusual thing is that the designs are not mirror images of each other, as is usual with lappet sets. The technique and design are very well done. Another set from the Earnshaw collection with a similar ground came up for sale on Ebay recently, http://tinyurl.com/ztrskgb. Date: Probably around 1720-40, square ends might indicate an earlier date. Modifications: Looks like the tops are cut and secured. Damage: Occasional small hole in the ground and in the clothwork. Sold for $360.00, 5 bidders. Comments: A narrow Beds lappet scarf with an interesting trail down the middle and at the ends. Note the extensive woven tallies in the fillings, and leaves throughout the piece. Damage: Seller cites minor pulls that I’m having trouble finding. Finish: A little creasing along one edge. Might be a soft fold crease near one end, hard to tell. Sold for ©10.99, 1 bidder. Comments: This is unusual. 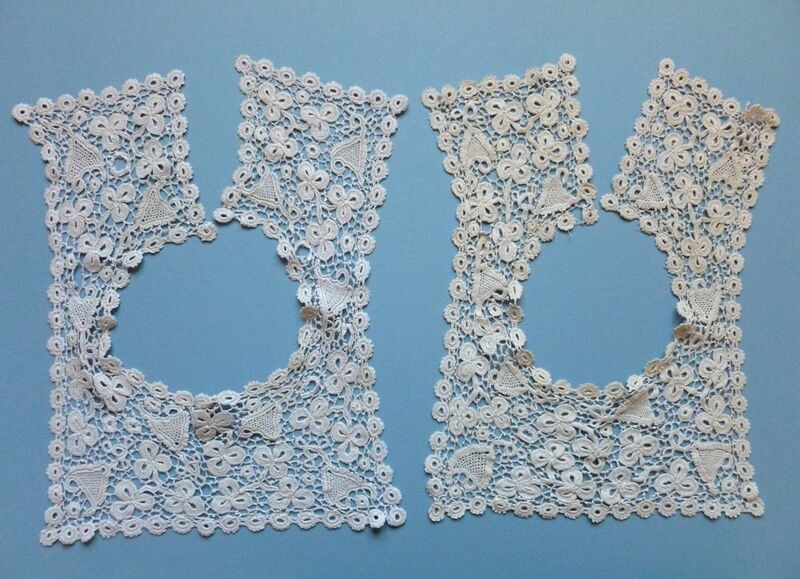 Two matching Irish Crochet dress fronts. Conventional trefoil and harp motifs, with the trefoils arranged in the typical three-part pinwheel. Small circular flowers around all edges. Irregular picoted brides, no raised work. Provenance: Name “Edie Wallis” attached to one. Sold for £1625, 3 bidders. 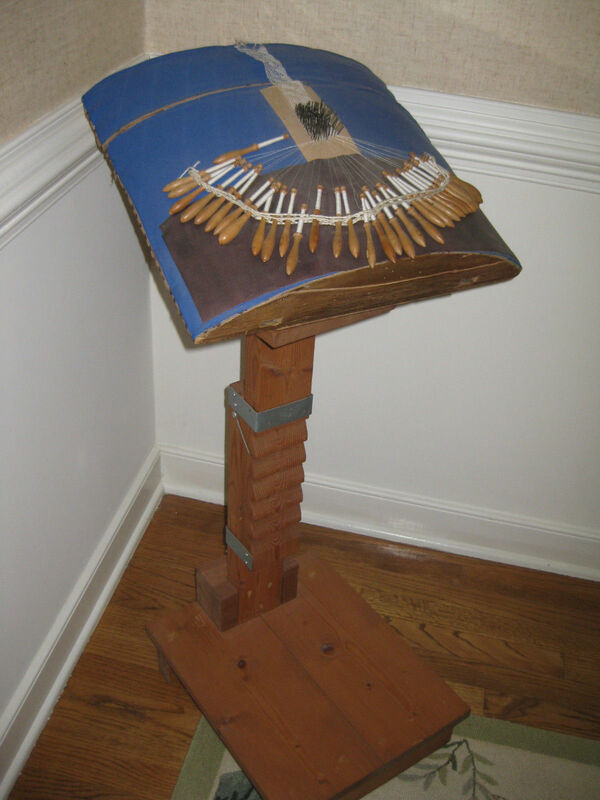 Size: 31″ wide laid flat – see description. 11″ long. Comments: Might be a French piece given the elaborate work at the bottom. It is a dress front with attached choker collar. The combination of a lighter ‘Rose of Sharon’ variation on top and the very heavy work on the bottom is quite effective. 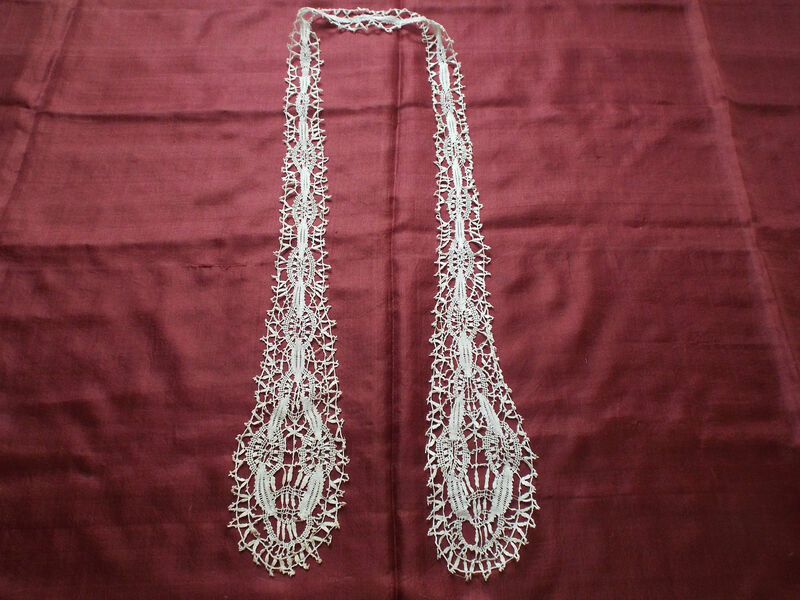 Note the bullion knots used as picots at the bottom. Heavy raised work is tightly done, and the design has a good left-right symmetry. Modifications: None. Looks like there are some fabric remains sewn along the outside lower edge. Note the covered buttons at the top left, these attach to long loops on the top right. Damage: Seller cites a few imperfections, I see one broken bride. What looks like a buttonhole at top left of the choker might be a hole. Finish: No obvious creasing or wrinkle – the form doesn’t lay flat. Comments: A collar of Carrickmacross applique on machine net. Typical looped picots along the ends. A few picoted bar fillings, along with some needlerun fillings. A few scattered esprits. Damage: Some localized loose picots along the neckline. Soilage: Seller cites a cream color. Finish: Creased, especially toward the bottom. Size: 26 cm long, 47 cm wide. Comments: A fan of Brussels Duchesse with imitation tortoiseshell sticks. The Point de Gaze insert is an unusual floral basket with two small raised petal roses. The body of the basket has rectangular grid filling. 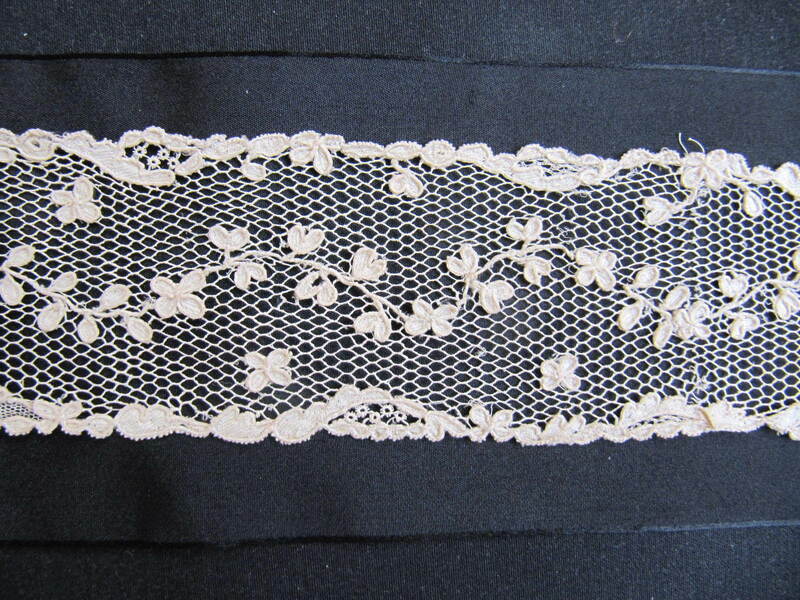 Conventional motifs in the bobbinlace, no raised work. 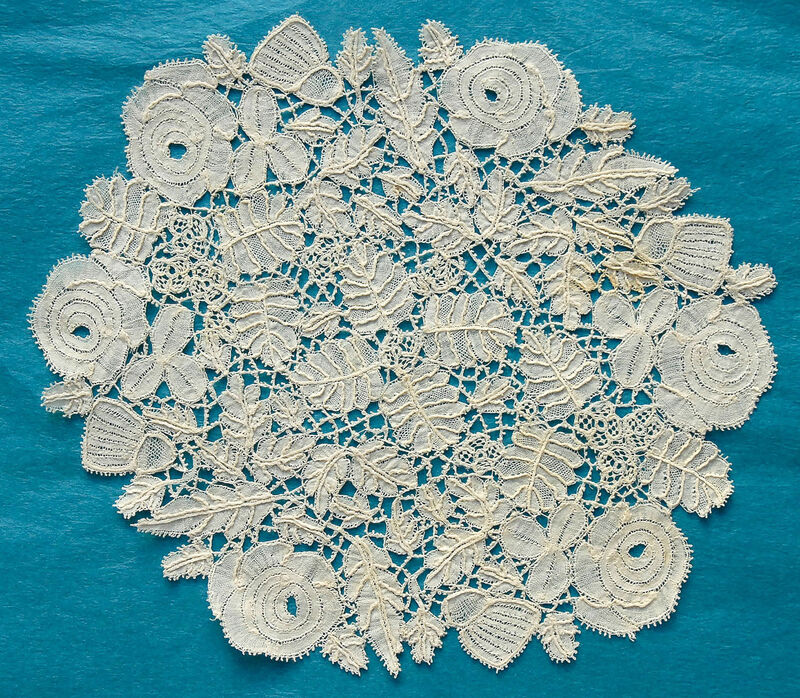 I think the scale in the design is a bit off, the bobbinlace motifs are a bit large compared to the very fine needlelace. Interesting combination with the dark sticks. Damage: Nothing obvious in the lace, ptdG mesh looks good. Seller cites some detachment from the sticks. Sticks have some breaks and scratches. Soilage: Seller cites antique aged white color. Might be one brown spot where lace attached to a guard stick. Comments: A triangular Chantilly shawl. 2nd Empire romantic floral design, no ombré, no esprits in the ground. The designs are a little less naturalistic than in other contemporary examples. Difficult to get a good look at the whole thing since there’s no overall view in the photos. 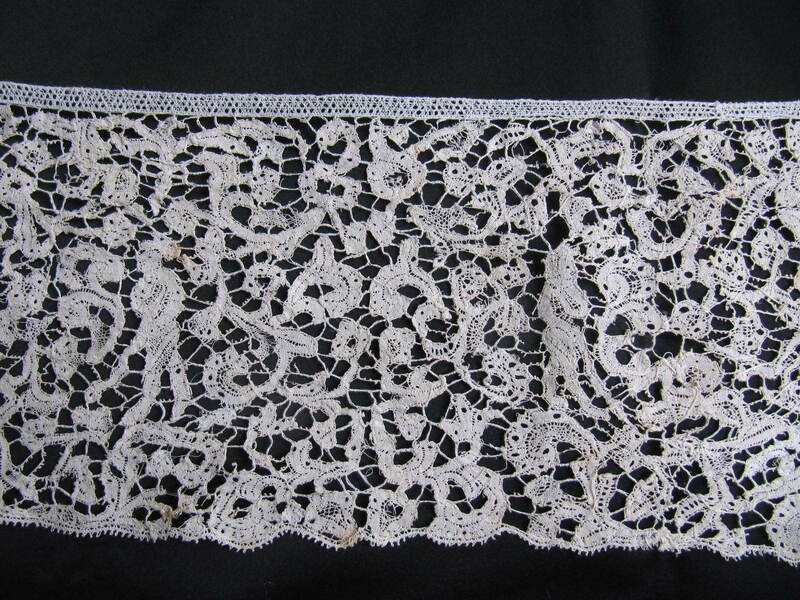 Modifications: A later picot edge has been added, unusual for this kind of lace. Damage: Several holes of different sizes, largest along one border. Picot edge coming away in places. Soilage: Looks clean, but difficult to tell with black lace. Sold for $100.00, 4 bidders. 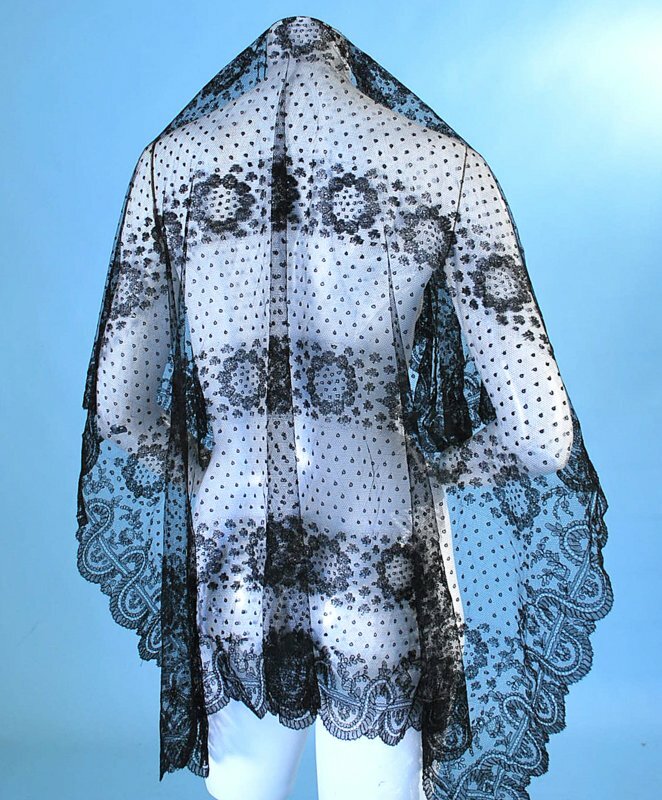 Comments: An unusual square Chantilly shawl. I’ve never seen this pattern of horizontal stripes before, and am at a bit of a loss to tell how this might be worn. Note the extensive esprits in the ground, and the small buds between the main circles of flowers in the horizontal lines. Would be interesting to see the entire thing laid flat, maybe the undulating border combined with the horizontal stripes might make more sense. Hard to tell if it is French or Belgian. I’m leaning toward Belgium, some of the photos seen to show a very dark color, typical of slightly heavier thread used in Belgium. Damage: Nothing obvious from the photos, but there are few closeups. Sold for $122.50, 3 bidders. Size: cuffs 5″ x 9.5″. border, 2″ x 2 yards, 1 yard of which has an additional 1″ border added at the top. Comments: Two cuffs and a border of Honiton. Snails/slugs style. Note the inclusion of pre-made tapes in the border – these might be handmade, photos are a bit fuzzy. The cuffs have irregular picoted bride ground with a rather scattered design and grids of woven tally leadwork fillings. I like the overall effect. The border is typical of later Honiton where the inclusion of the pre-made tapes helps speed up the work. Modifications: None on the cuffs. One end looks cut on the border, can’t see the other end. Then there’s additional top border added to one half of the piece. Size: 36.5″ neckline, 53″ outside length. 7″-8″ deep. Comments: A deep Honiton shawl collar or bertha. Snails/slugs style with irregular unpicoted brides. Extensive leadwork tally fillings. This is an unusually large piece in a rather naive style. The motifs don’t show much variation, although there is an interesting flower with spiky petals. Good example of the type in a rare form. Damage: A little fraying and overall light wear. Sold for $50.00, 1 bidder. Comments: A long Bucks border. Note both the honeycomb/tally and Mayflower fillings. I am wondering about all the joins, which are carefully done in a zig-zag pattern along the lines of the mesh. Three are done at the same point in the pattern, but the spacing of the joins, and the fact that the pattern is interrupted after one of them makes me think this was not part of the original manufacturer and is more likely some kind of repair. Modifications: 5 joins. Both ends cut. Finish: Vertical fold and other creases. 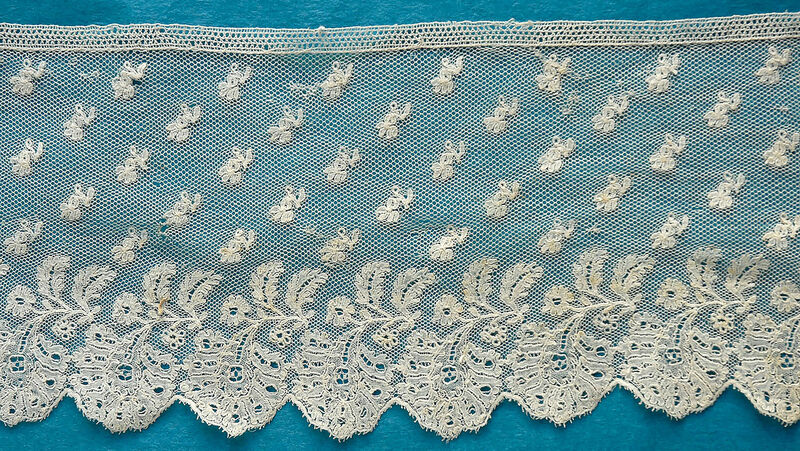 Comments: There is a lot of excellent new Vologda lace, but we don’t often see it on Ebay. 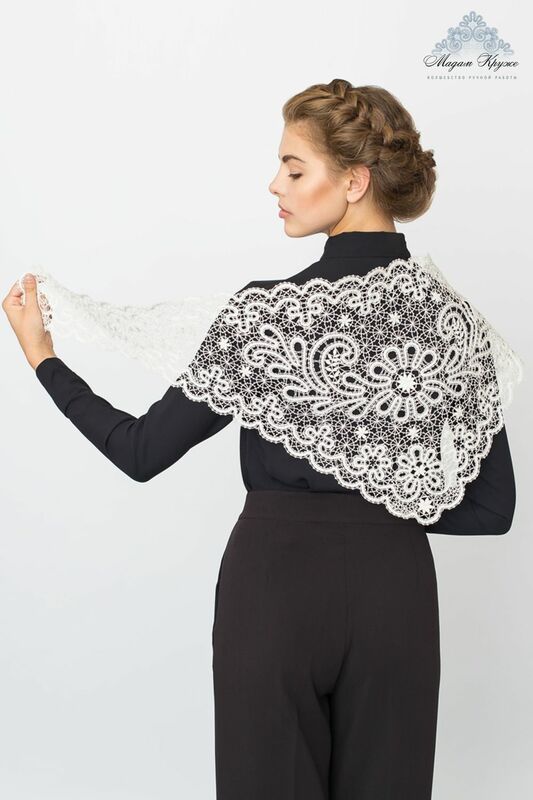 This example is a ‘mantilla’ form shawl or headscarf, triangular with long lappet-like ends. 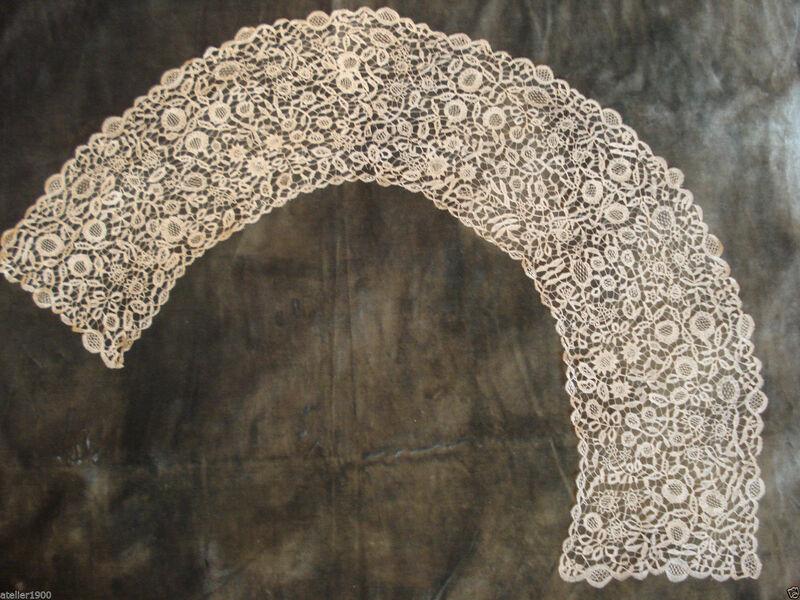 Very typical Vologda tape lace and elaborate ground work. The woven leaves are beautifully done. Date: New in original packaging. 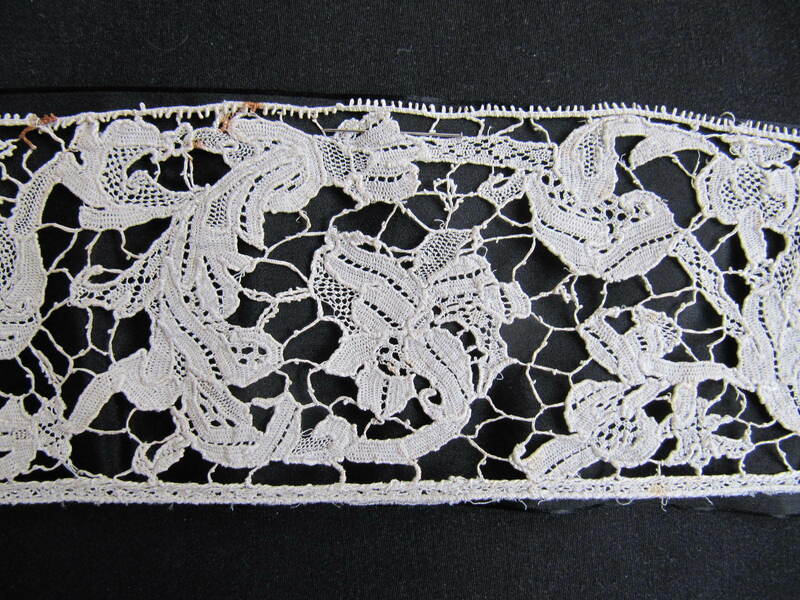 Comments: A pair of lappets with matching border of Brussels bobbinlace with droschel ground. The border could have been the frill going around a now missing cap back. 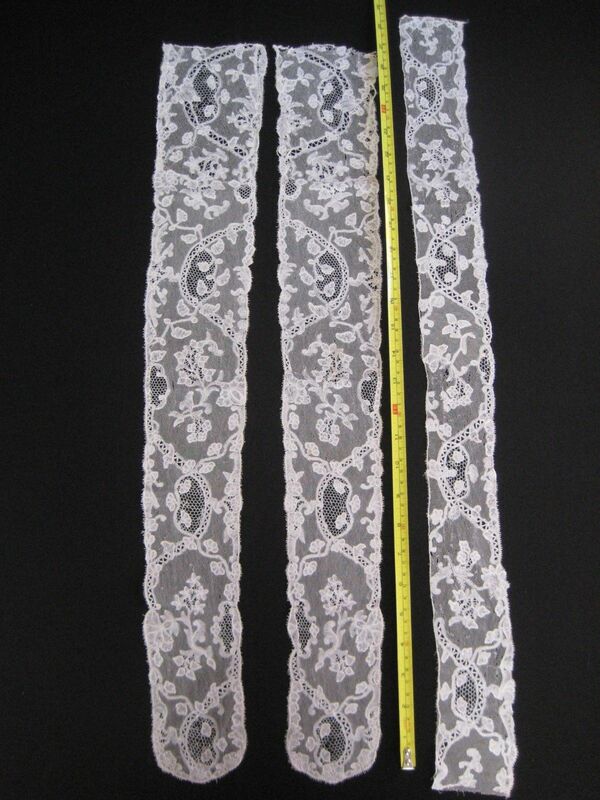 It would be interesting to match the cut ends of the border to the tops of the lappets to see if they fit. Louis XV undulating design of the mid 18th c. I do think this is a Belgian piece, although some of the motifs are a little blocky, resembling English work. 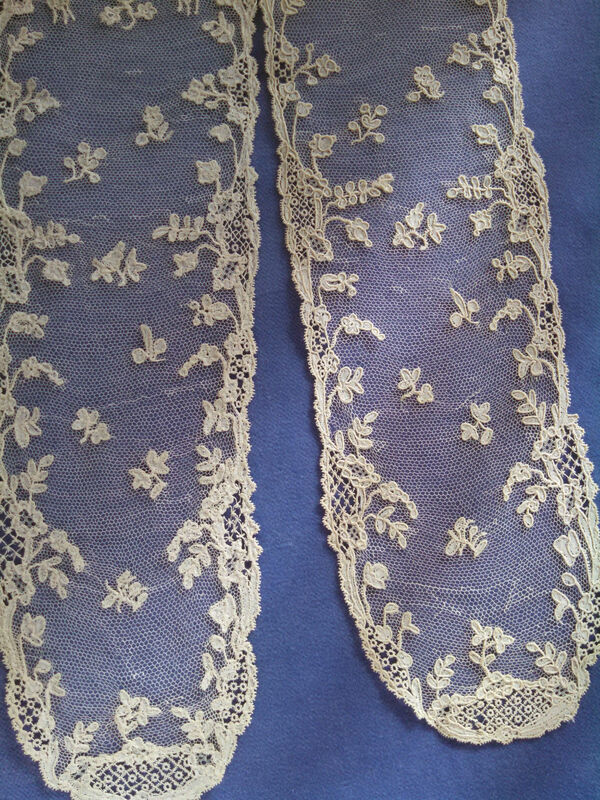 Modifications: One lappet cut at the top, the other top could be original. Border is cut on both ends. The picot edge along the lower edge of the band is a later replacement. Damage: Holes and pinholes in the mesh. Part of the mesh in the border has been replaced with machine tulle. 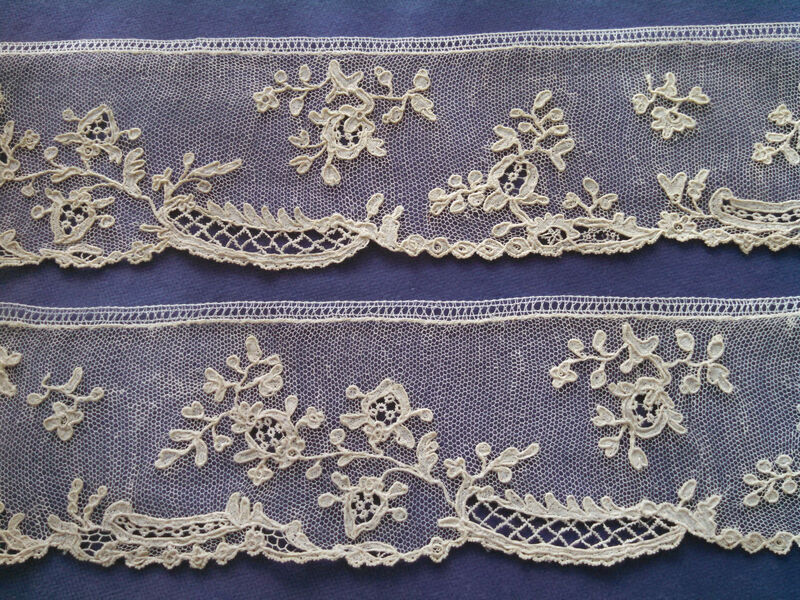 The droschel ground has also been replaced at the tops of both lappets, I think with more droschel ground – or perhaps it was just done by a different lacemaker. 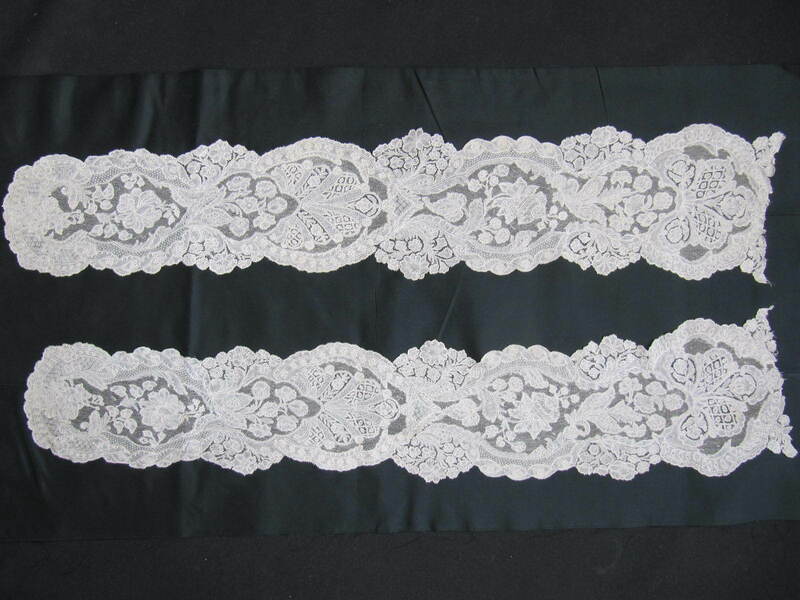 The ground in the lower portions of the lappets is much finer (and in better condition) than in the upper portion. Holes and pinholes throughout, mostly in the replacements and in some fillings. Soilage: All pieces look clean. $32.00, 2 bidders, reserve not met. Comments: A border of Mechlin, with a dense lower floral border and 5 rows of buds used as esprits. Very short repeat, meant to be ruffled. This type of design lasted a long time, you even see it made in WWI. The general wear on this piece looks early, and I’m thinking it might be linen. Need a microscope to test that theory. Date: 2nd quarter 19th c.
Modifications: Cut one end, can’t see the other end. One join, engrelure added. Damage: Pinholes in the mesh. Localized repairs to the mesh. Soilage: Cream color in the photos, I see some localized small red spots in the closeups. Size: ~13″ x 10 yards. Comments: A long Chantilly flounce, made up of 4 horizontal strips, racroc lines are nicely visible. Width and length are very typical of Chantilly in this period. No ombré shading. It’s a fairly simple floral design. Damage: Pinholes in the mesh, and occasional separation of the engrelure. Comments: A small mat of Honiton guipure, well out of the snails/slugs mode. I especially like the way the roses are worked, almost ‘line drawn’ like you seen in Valenciennes. The piece says true to its origins in design organization, and note the little 4 petaled flowers with leadwork fillings. You see something a bit similar in the Honiton bertha reviewed above. 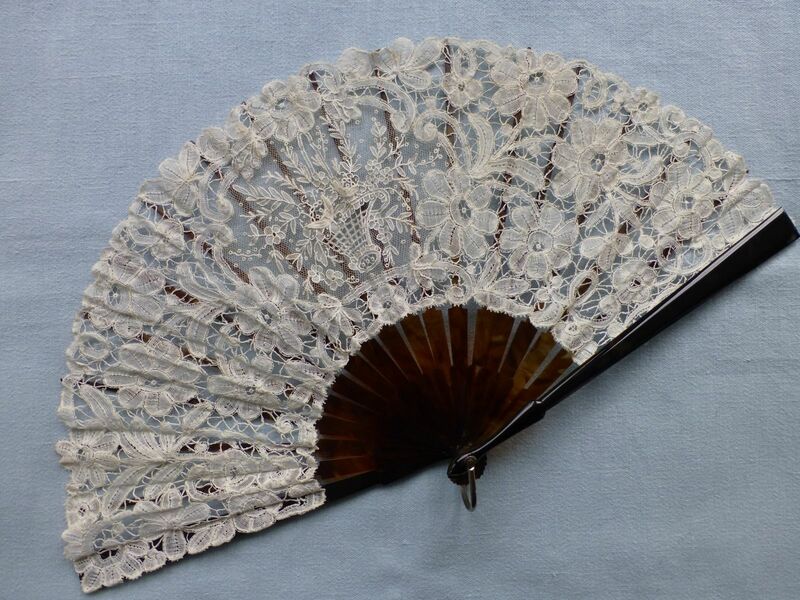 Comments: A pair of Brussels bobbinlace lappets with droschel ground, very fine design and construction. The rounded ends appeared a little later than square end examples. 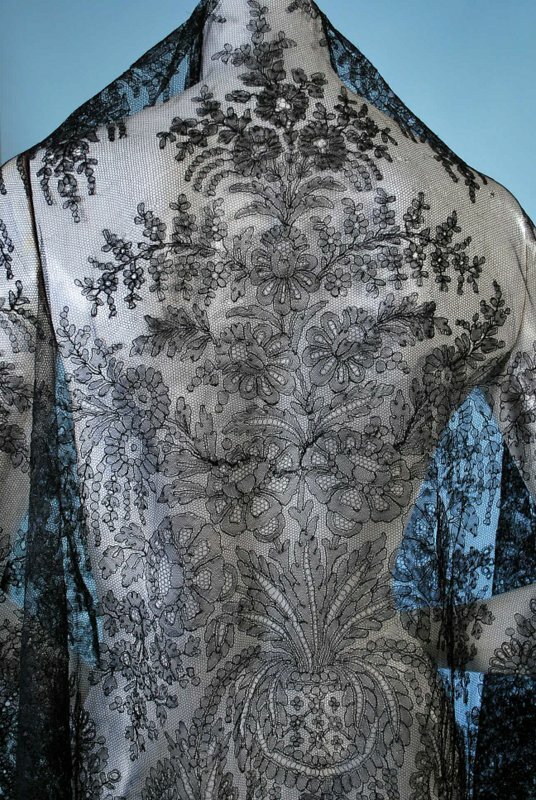 The density of the design along the sides and ends is such that many people seeing this kind of lace for the first time don’t even believe it is lace. 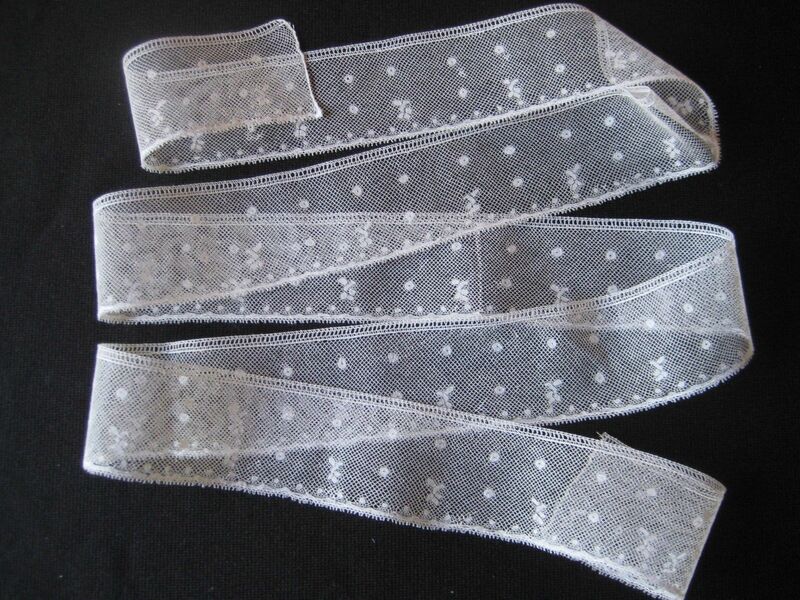 Lappets like this can get a little better in design and condition, but not very much. Modifications: Cut at the tops. Damage: One small hole at the end of one lappet. I think there might be a little repair to the mesh in small places. $189.59, 6 bidders, reserve not met. 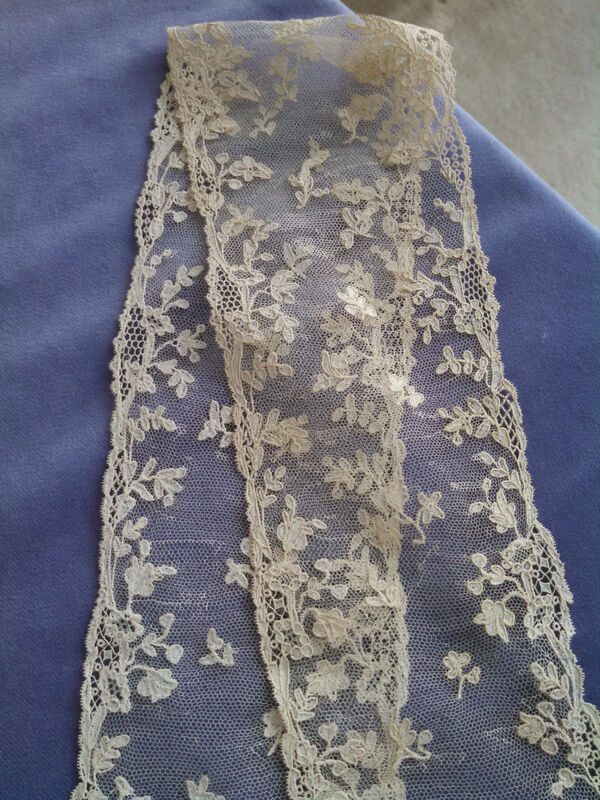 Comments: I think this might be a joined lappet set with the ends cut off. Hard to tell, but the ‘repair’ cited by the seller might be the join. The ground has me confused, there aren’t any closeups to really tell how it is made. The sides of the mesh are quite thick which might indicate buttonholing, however there are also some open gaps which look more like a twisted cover to the mesh. It’s probably something inbetween. The toilé is very dense with simple cordonnet, picoted only on the outer edge. No sign of horsehair, which is sometime cited as a characteristic of Argentan. Modifications: Cut at the ends, one join. Damage: A few small holes in the mesh, some repair. $11.50, 2 bidders, reserve not met. Comments: A figural Flemish bobbinlace, and some of the figures don’t look human. It’s an odd piece with a lot of condition issues. This one is hard to evaluate. Date: 1st quarter 18th c.
Modifications: Ends cut, engrelure added. Not enough closeups, but I think the picot edge is a later addition. 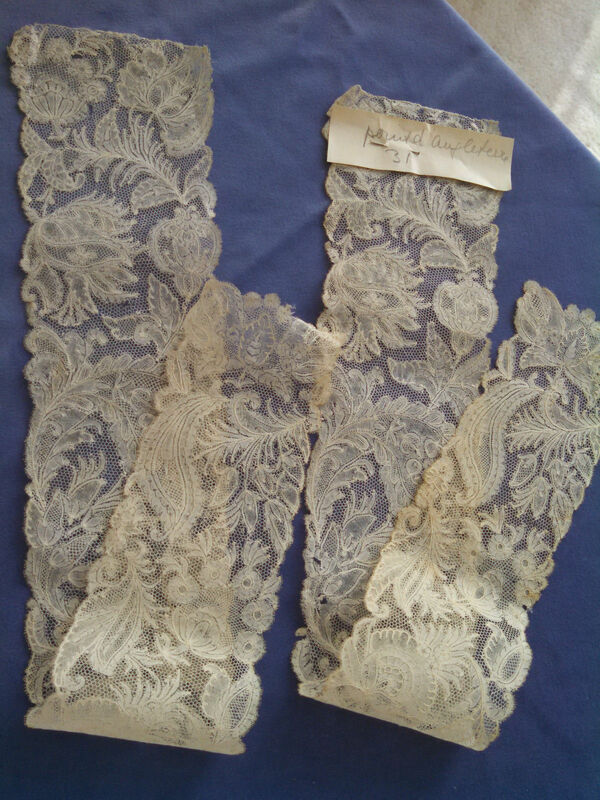 There is a short replacement made with a different lace near the right end (stylistic difference). Damage: Fraying and general wear throughout. Some attempts at repair. Sold for $330.00, 8 bidders. 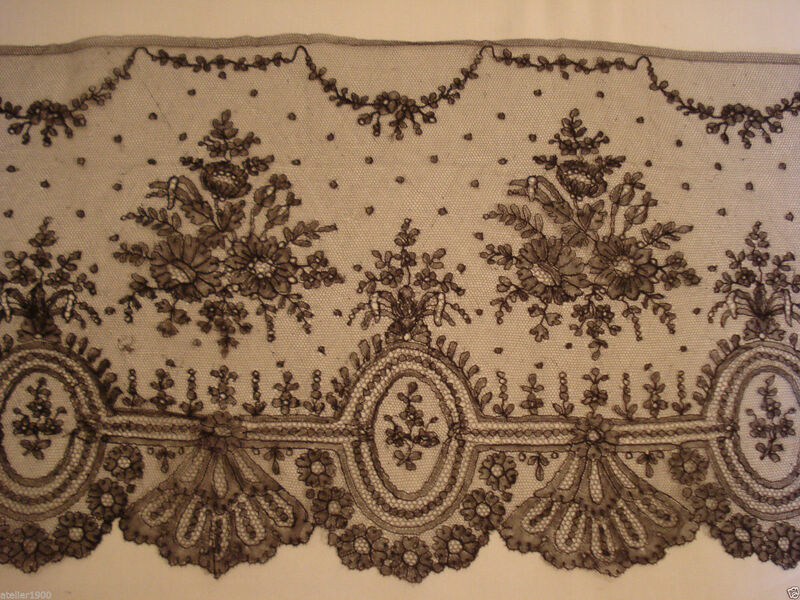 Comments: English flat needlelace, mid 17th c. English needlelace of this period has one very obvious characteristic never found in Italian or French examples. The stitches are knotted, not twisted buttonhole. This give the clothwork a rather grainy, open appearance. English examples also never use a separate cordonnet. 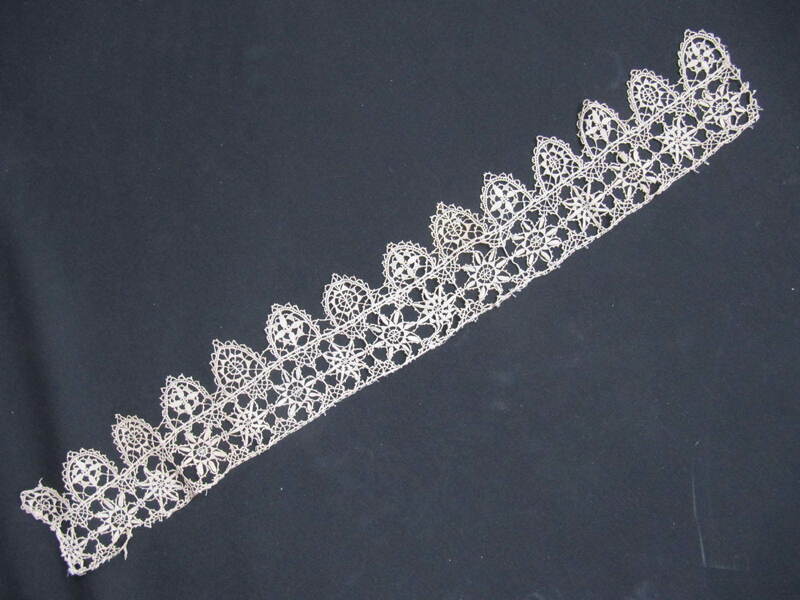 There are slightly over two repeats in this piece, and long pieces of this lace are fairly common. 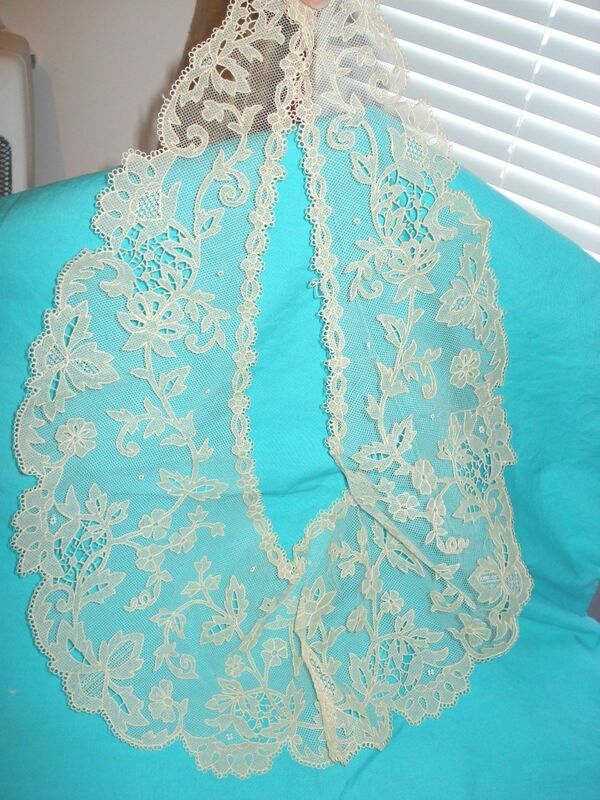 This is also a lace that often includes initials or dates in the pattern, but I don’t see any here. 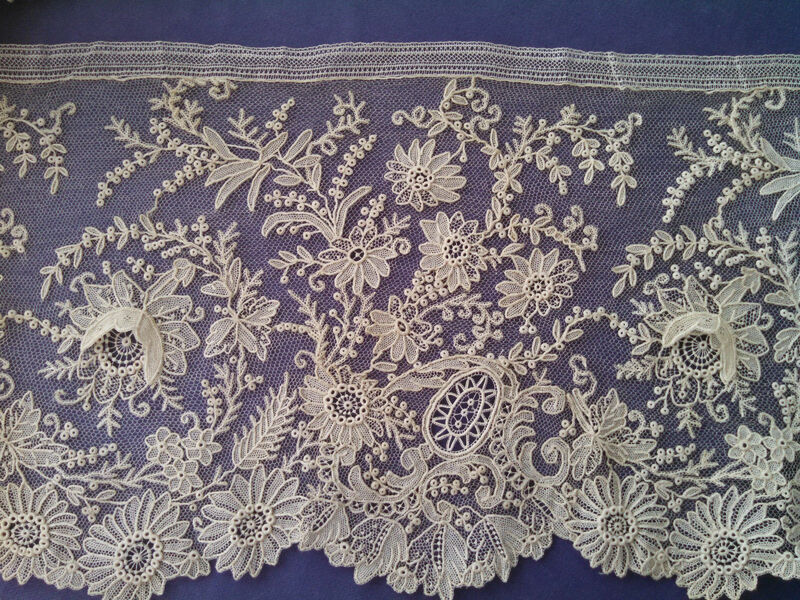 The rather heavy appearance of this lace often causes confusion, but a close looks discovers many key identifying characteristics. Modifications: Ends cut, bottom picoted edge does not look original. Engrelure added. Sold for $160.00, 3 bidders. Comments: A Punto in Aria border – note the woven band which is the base of the point border. That is not unexpected in Punto in Aria, which lacks the drawn and cutwork cloth base of Reticella. I do like this feature in terms of dating this lace. However, after the recent workshop at the Metropolitan Museum of Art, I am very, very hesitant to attribute dates to pieces like this. 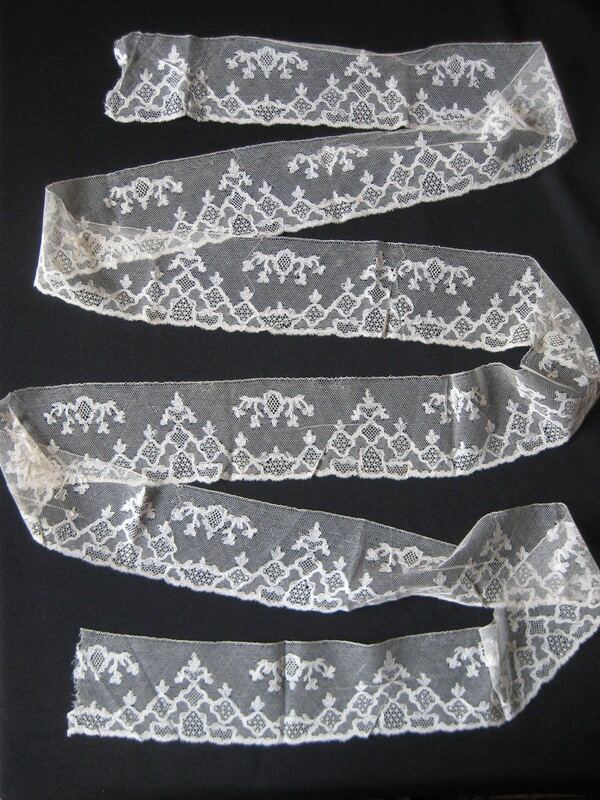 There were extensive copies of early laces made primarily in Italy at the end of the 19th c, and suddenly a lot of similar museum examples are being called into question, even if they look absolutely authentic. 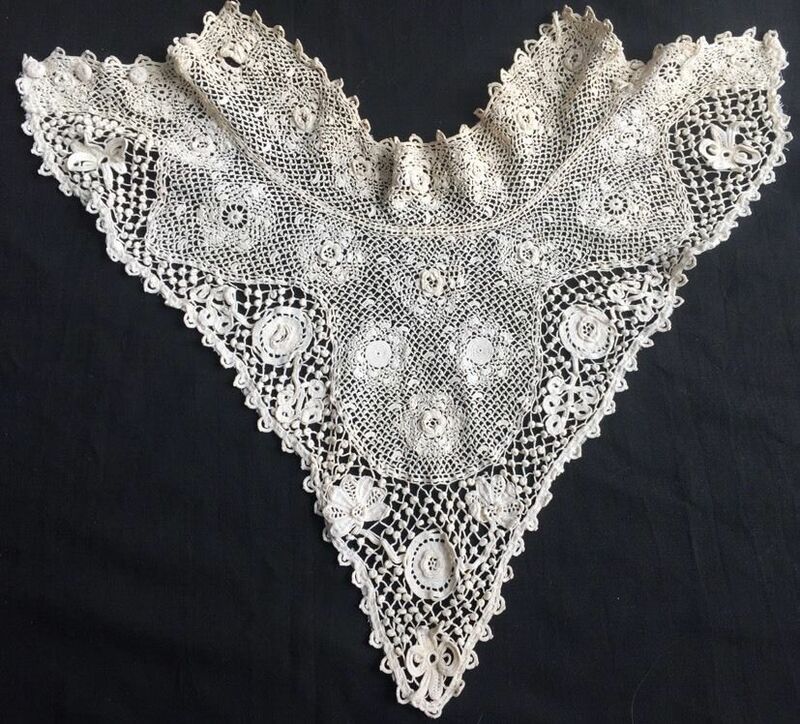 Many of the donors were intimately involved in the formation of lace schools in Italy and it is unsure if what they gave were originals or copies. Damage: Occasional broken bride and gaps along edges. $51.00, 3 bidders, reserve not met.